The Penetraitt Strengthening and Repair Shampoo from the product range by Sebastian is wonderfully suitable for daily hair care. The foundation cleanses the hair of dirt, replacing it with a natural shine. After showering a pleasant scent remains like a soft veil over the body. 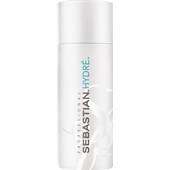 The Penetraitt Strengthening and Repair Shampoo from the range by Sebastian contains various ingredients which make up a special formula. The ingredients ensure active regeneration of the hair and build this from the inside out. Damage from heat styling and chemical treatments are repaired by the hair care product. The natural hair colour of the user is protected. The hair feels silky-soft and is strengthened. Simply and optimal companion for your daily washing and cleansing routine. Massage into wet hair to activate the gentle foam. Carefully rinse out. Repeat as needed. Finally apply Hydre Conditioner.